I was searching on FamilySearch tonight and was reading the news stories on this site when I came a cross this new press release below regarding three genealogical libraries pooling their collections together in a massive digitization project. The three libraries include, The Allen County Public Library, The Harold B. Lee Library, and the FamilySearch Family History Library. The great thing about this venture is that when the project is completed, we will be able to access the records for free through the www.familyhistoryarchive.byu.edu. Family History is becoming easier to find records because of the diligence and foresight of many people. Thank you for your hard work. We appreciate it. FamilySearch is providing the computers, scanners, and camera operators required to complete the project. FamilySearch is a nonprofit organization sponsored by The Church of Jesus Christ of Latter-day Saints. 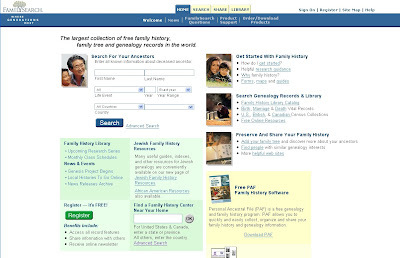 FamilySearch maintains the world's largest repository of genealogical resources accessed through FamilySearch.org, the Family History Library in Salt Lake City, and over 4,500 family history centers in 70 countries."